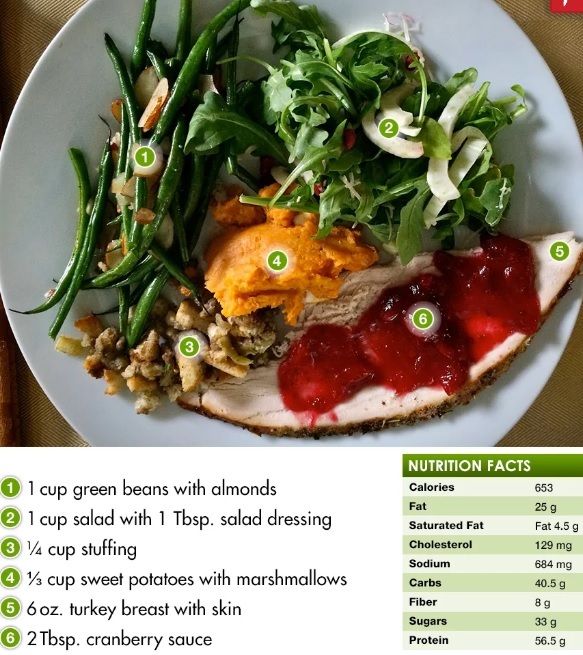 Fit Fluential Mom: Thanksgiving Dinner Revised! So you’re probably going to eat more than usual on Thanksgiving and I get it. It’s a popular foodie holiday, but you also don’t want to wake up the next morning and feel like you've undone all of your progress. Of course, if you’ve been exercising and eating right, one day won’t undo all the work you’ve done but, as you head into winter, it’s easy to fall off the wagon and struggle to get back on. 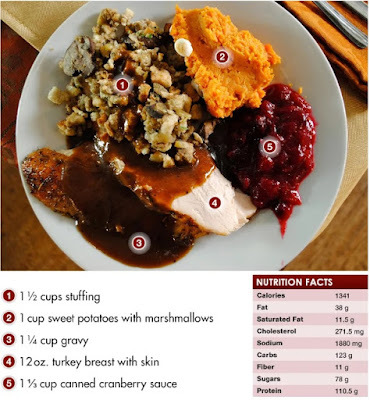 So, with that in mind, here are some examples from Autumn Calabrese’s video shoot and the Team Beachbody blog to help you properly plate your Thanksgiving meal. Honestly, this is what the typical Thanksgiving dinner looks like. So, it looks pretty healthy but a lot is missing. First off, where are the greens? And, secondly, this plate is so high in carbs and sugar, it’s no wonder everyone wants to nap after the typical Thanksgiving dinner. Registered Dietician, Ani Aratounians weighed in on this typical Thanksgiving plate. “It’s high in carbs and there’s lot of sugar and fat. Especially saturated fat. There’s butter everywhere and hardly any fiber. After eating this plate, you’ll feel stuffed and bloated.” And this doesn’t even take into consideration the pie. Or the wine. Or seconds…or thirds. One easy way to totally redo your Thanksgiving plate (and still have all your favorites) is to start with the greens. Put the green beans and the salad on your plate first. Then, add the turkey (aim for the the skinless, breast pieces if you can find them), and then add on your other favorites in small quantities. The calories aren’t exactly low, but they’re much more reasonable than the first plate. Aratounians’s thoughts on this plate were much more positive. “This is much higher in vitamins and minerals, and antioxidants. Overall, this is much more balanced for your blood sugar with the protein and fiber in the veggies balancing out sugar content. And it’s a much prettier plate too!” She recommends, if you are going to go for seconds (and really, who isn’t), go for the greens and protein (again, ideally, without skin). I hope this comparison helps you come Thursday! What do you plan to eat on Thanksgiving? Try to plan ahead, serve your food when you're there and walk AWAY from the food table! And watch your alcohol calories too! Thanks, this helps out alot, i will deffinitely do my plate like the healthy one!